Wholesale Akoya and freshwater pearl earrings, Tahitian pearl earrings, south sea pearl earrings, shell pearl earrings, mother of pearl shell earrings. 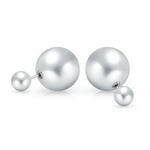 Features dangle pearl drop earrings, pearl stud earrings, chandelier earrings, and clip pearl earrings. Lovely pair of earrings. Small in size. ..